This article is about alpha-linolenic acid. For other uses, see Linolenic acid. The word linolenic is an irregular derivation from linoleic, which itself is derived from the Greek word linon (flax). Oleic means "of or relating to oleic acid" because saturating linoleic acid's omega-6 double bond produces oleic acid. α-Linolenic acid was first isolated by Rollett as cited in J. W. McCutcheon's synthesis in 1942, and referred to in Green and Hilditch's 1930s survey. It was first artificially synthesized in 1995 from C6 homologating agents. A Wittig reaction of the phosphonium salt of [(Z-Z)-nona-3,6-dien-1-yl]triphenylphosphonium bromide with methyl 9-oxononanoate, followed by saponification, completed the synthesis. Seed oils are the richest sources of α-linolenic acid, notably those of hempseed, chia, perilla, flaxseed (linseed oil), rapeseed (canola), and soybeans. α-Linolenic acid is also obtained from the thylakoid membranes in the leaves of Pisum sativum (pea leaves). Plant chloroplasts consisting of more than 95 percent of photosynthetic thylakoid membranes are highly fluid due to the large abundance of linolenic acid, that shows up as sharp resonances in high-resolution carbon-13 NMR spectra, invariably. Some studies state that ALA remains stable during processing and cooking. However, other studies state that ALA might not be suitable for baking, as it will polymerize with itself, a feature exploited in paint with transition metal catalysts. Some ALA may also oxidize at baking temperatures. ALA percentages in the table below refer to the oils extracted from each item. Flax is a rich source of α-linolenic acid. Although the best source of ALA is seeds, most seeds and seed oils are much richer in an n−6 fatty acid, linoleic acid. Exceptions include flaxseed (must be ground for proper nutrient absorption) and chia seeds. Linoleic acid is the other essential fatty acid, but it, and the other n−6 fatty acids, compete with n−3s for positions in cell membranes and have very different effects on human health. There is a complex set of essential fatty acid interactions. α-Linolenic acid can only be obtained by humans through their diets because the absence of the required 12- and 15-desaturase enzymes makes de novo synthesis from stearic acid impossible. Eicosapentaenoic acid (EPA; 20:5, n−3) and docosahexaenoic acid (DHA; 22:6, n−3) are readily available from fish and algae oil and play a vital role in many metabolic processes. These can also be synthesized by humans from dietary α-linolenic acid, but with an efficiency of only a few percent. Because the efficacy of n−3 long-chain polyunsaturated fatty acid (LC-PUFA) synthesis decreases down the cascade of α-linolenic acid conversion, DHA synthesis from α-linolenic acid is even more restricted than that of EPA. Conversion of ALA to DHA is higher in women than in men. Multiple studies have shown a relationship between α-linolenic acid and an increased risk of prostate cancer. This risk was found to be irrespective of source of origin (e.g., meat, vegetable oil). However, a large 2006 study found no association between total α-linolenic acid intake and overall risk of prostate cancer; and a 2009 meta-analysis found evidence of publication bias in earlier studies, and concluded that if ALA contributes to increased prostate cancer risk, the increase in risk is quite small. α-Linolenic acid is relatively more susceptible to oxidation and will become rancid more quickly than many other oils. Oxidative instability of α-linolenic acid is one reason why producers choose to partially hydrogenate oils containing α-linolenic acid, such as soybean oil. Soybeans are the largest source of edible oils in the U.S., and, as of a 2007 study, 40% of soy oil production was partially hydrogenated. However, when partially hydrogenated, part of the unsaturated fatty acids become unhealthy trans fats. Consumers are increasingly avoiding products that contain trans fats, and governments have begun to ban trans fats in food products. These regulations and market pressures have spurred the development of low-α-linolenic acid soybeans. These new soybean varieties yield a more stable oil that doesn't require hydrogenation for many applications, thus providing trans fat-free products, such as frying oil. Several consortia are bringing low-α-linolenic acid soy to market. DuPont's effort involves silencing the FAD2 gene that codes for Δ6-desaturase, giving a soy oil with very low levels of both α-linolenic acid and linoleic acid. Monsanto Company has introduced to the market Vistive, their brand of low α-linolenic acid soybeans, which is less controversial than GMO offerings, as it was created via conventional breeding techniques. ^ Loreau, O; Maret, A; Poullain, D; Chardigny, JM; Sébédio, JL; Beaufrère, B; Noël, JP (2000). "Large-scale preparation of (9Z,12E)-1-(13)C-octadeca-9,12-dienoic acid, (9Z,12Z,15E)-1-(13)C-octadeca-9,12,15-trienoic acid and their 1-(13)C all-cis isomers". Chemistry and Physics of Lipids. 106 (1): 65–78. doi:10.1016/S0009-3084(00)00137-7. PMID 10878236. ^ a b c Beare-Rogers (2001). "IUPAC Lexicon of Lipid Nutrition" (PDF). Archived (PDF) from the original on 12 February 2006. Retrieved 22 February 2006. ^ Rollett, A. (1909). "Zur kenntnis der linolensäure und des leinöls". Z. Physiol. Chem. 62 (5–6): 422–431. doi:10.1515/bchm2.1909.62.5-6.422. ^ Green, TG; Hilditch, TP (1935). "The identification of linoleic and linolenic acids". Biochem. J. 29 (7): 1552–63. PMC 1266662. PMID 16745822. ^ Sandri, J.; Viala, J. (1995). "Direct preparation of (Z,Z)-1,4-dienic units with a new C6 homologating agent: synthesis of alpha-linolenic acid". Synthesis. 3 (3): 271–275. doi:10.1055/s-1995-3906. ^ Chapman, David J.; De-Felice, John; Barber, James (May 1983). "Growth temperature effects on thylakoid membrane lipid and protein content of pea chloroplasts 1". Plant Physiol. 72 (1): 225–228. doi:10.1104/pp.72.1.225. PMC 1066200. PMID 16662966. ^ Manthey, F. A.; Lee, R. E.; Hall Ca, 3rd (2002). "Processing and cooking effects on lipid content and stability of alpha-linolenic acid in spaghetti containing ground flaxseed". J. Agric. Food Chem. 50 (6): 1668–71. doi:10.1021/jf011147s. PMID 11879055. ^ "OXIDATIVE STABILITY OF FLAXSEED LIPIDS DURING BAKING". ^ Li, Thomas S. C. (1999). "Sea buckthorn: New crop opportunity". Perspectives on new crops and new uses. Alexandria, VA: ASHS Press. pp. 335–337. Archived from the original on 22 September 2006. Retrieved 28 October 2006. ^ "Omega-3 fatty acids". University of Maryland Medical Center. ^ Breanne M Anderson; David WL Ma (2009). 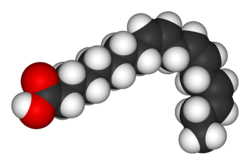 "Are all n-3 polyunsaturated fatty acids created equal?". Lipids in Health and Disease. 8 (33): 33. doi:10.1186/1476-511X-8-33. PMC 3224740. PMID 19664246. ^ Shiels M. Innis (2007). "Fatty acids and early human development". Early Human Development. 83 (12): 761–766. doi:10.1016/j.earlhumdev.2007.09.004. PMID 17920214. ^ Burdge, GC; Calder, PC (2005). "Conversion of alpha-linolenic acid to longer-chain polyunsaturated fatty acids in human adults" (PDF). Reproduction, Nutrition, Development. 45 (5): 581–97. doi:10.1051/rnd:2005047. PMID 16188209. ^ "Conversion of $\alpha$-linolenic acid to longer-chain polyunsaturated fatty acids in human adults". ^ Ramon, JM; Bou, R; Romea, S; Alkiza, ME; Jacas, M; Ribes, J; Oromi, J (2000). "Dietary fat intake and prostate cancer risk: a case-control study in Spain". Cancer Causes & Control. 11 (8): 679–85. doi:10.1023/A:1008924116552. PMID 11065004. ^ Brouwer, IA; Katan, MB; Zock, PL (2004). "Dietary alpha-linolenic acid is associated with reduced risk of fatal coronary heart disease, but increased prostate cancer risk: a meta-analysis". The Journal of Nutrition. 134 (4): 919–22. doi:10.1093/jn/134.4.919. PMID 15051847. ^ De Stéfani, E; Deneo-Pellegrini, H; Boffetta, P; Ronco, A; Mendilaharsu, M (2000). "Alpha-linolenic acid and risk of prostate cancer: a case-control study in Uruguay". Cancer Epidemiology, Biomarkers & Prevention. 9 (3): 335–8. PMID 10750674. ^ Koralek DO, Peters U, Andriole G, et al. (2006). "A prospective study of dietary α-linolenic acid and the risk of prostate cancer (United States)". Cancer Causes & Control. 17 (6): 783–791. doi:10.1007/s10552-006-0014-x. PMID 16783606. ^ Simon, JA; Chen, YH; Bent, S (May 2009). "The relation of alpha-linolenic acid to the risk of prostate cancer". American Journal of Clinical Nutrition. 89 (5): 1558S–1564S. doi:10.3945/ajcn.2009.26736E. PMID 19321563. ^ Kinney, Tony. "Metabolism in plants to produce healthier food oils (slide #4)" (PDF). Archived from the original (PDF) on 29 September 2006. Retrieved 11 January 2007. ^ Fitzgerald, Anne; Brasher, Philip. "Ban on trans fat could benefit Iowa". Truth About Trade and Technology. Archived from the original on 27 September 2007. Retrieved 3 January 2007. ^ Monsanto. "ADM to process Monsanto's Vistive low linolenic soybeans at Indiana facility". Archived from the original on 11 December 2006. Retrieved 6 January 2007. ^ Kinney, Tony. "Metabolism in plants to produce healthier food oils" (PDF). Archived from the original (PDF) on 29 September 2006. Retrieved 11 January 2007. ^ Pan A, Chen M, Chowdhury R, et al. (December 2012). "α-Linolenic acid and risk of cardiovascular disease: a systematic review and meta-analysis". Am. J. Clin. Nutr. (Systematic review). 96 (6): 1262–73. doi:10.3945/ajcn.112.044040. PMC 3497923. PMID 23076616.